MOSCOW, April 15 (Xinhua) -- Moscow and Doha support the strengthening of ceasefire in Syria and an objective investigation into a chemical attack in the country's Idlib, Russian Foreign Minister Sergei Lavrov said here on Saturday. "With regard to Syria, our common position is the need to ensure a fully comprehensive ceasefire between the government and the armed opposition forces," Lavrov said at a press conference following talks with his Qatari counterpart Sheikh Mohammed bin Abdulrahman bin Jassim Al-Thani. Russia and Qatar also agree on the need to "continue anti-terror fight against the Islamic State and the Nusra Front terrorist groups, and accelerate the pursuit for a political solution to this crisis on the basis of UN Security Council resolutions," Lavrov said. 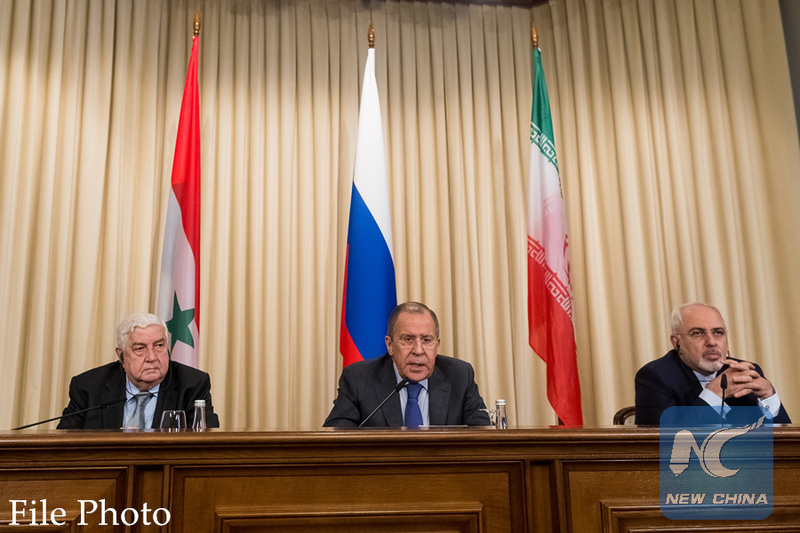 Lavrov said that the two parties had a regular dialogue covering key issues in the Middle East and North Africa, including the situation in Syria, Libya, Yemen and the Middle East settlement, as well as fighting international terrorism. "We are interested in comparing our assessments of efforts on settling the Syrian crisis, efforts in which Qatar plays a significant role," the minister said. Al-Thani, for his part, said that Qatar and Russia share similar views on the Syrian crisis settlement and that he hopes to bring the positions of Moscow and Doha on Syria closer in the negotiations. "Speaking of Syria, we agree on many issues ... We have certain differences on how to achieve these goals, but I hope that through constructive dialogue we will manage to work through the contradictions and we will achieve security and stability in Syria soon," Al-Thani said. According to Lavrov, the ministers also talked about the recent chemical weapons incident in Idlib, and both parties found it necessary to conduct "a thorough, objective, impartial and professional investigation." "Within the framework of the Organization for the Prohibition of Chemical Weapons and the United Nations, we will insist on the urgent dispatch of inspectors both to the scene of the incident and to the airport where, as our Western colleagues' claim, the projectiles with chemical substances were loaded." A reported April 4 toxic gas attack hit the rebel-held Idlib Province in northwestern Syria, killing over 80 people. The West accused the Syrian government of planning and launching the attack, while the latter denied the accusation, saying that its air strikes hit an arms depot containing toxic gas and blaming the rebels for storing such chemical materials. "It is necessary to bring all those responsible to justice, and therefore we will support all efforts aimed at that," Al-Thani said.